There’s a long strip of Chinese restaurants along King Georges Road and nearly all of them have dead fish in the windows. Not the Friendship, however. Here the perch and barramundi are tap dancing out of their tanks. The room itself is pretty standard – laminex tables and plastic chairs, a bar packed with Johnnie Walker, plus soft drinks that come by the jug – and the menu isn’t very long, but what it lists is very much worth the trip from fork to mouth. Baby bok choy doesn’t stay together the way you might hope but crispy snow peas added to the mix mask the fact that the slightly bitter ‘choy falls apart rather than stays together in sweet, pale chlorophylltinged tendrils. Salt and pepper squid isn’t as light as it could be and the batter could do with seasoning, but the triangles are lovely and tender and disappear off the plate faster than you can say cephalopod. Order the Peking duck and you’ll see the bird arrive in two courses, the first as a pancake. Here the bird is carved at the table and its maltysweet skin sits atop a soft pancake with a piece of green onion and blob of plum sauce swaddled into the mix. The second is sang choy bau where the remaining duck meat is mixed with little bits of green onion and a little red chilli served in a crisp, fresh iceberg lettuce cup. Yum. If you’ve caved to temptation and ordered a mud crab, keeping the tablecloth clean is low on your list of priorities. 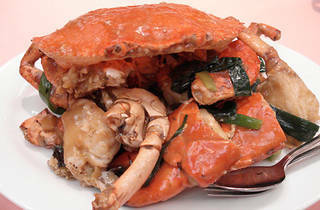 Play it straight with ginger and shallot and damn the mess – crab’s all about getting your hands dirty and picking at the fl esh inside the shell then sucking your fi ngers clean. 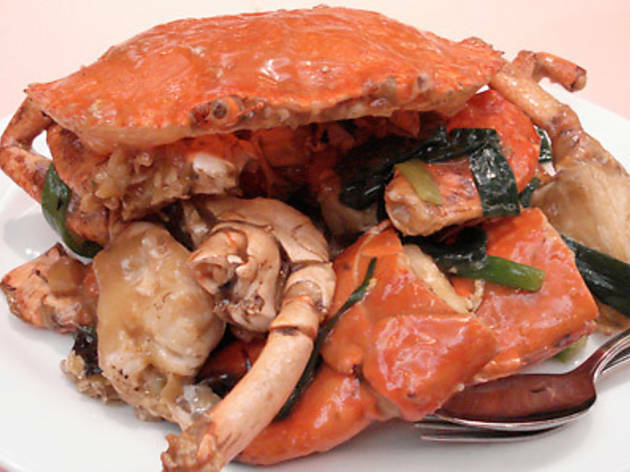 Though lady crabs are purportedly sweeter, man crabs have more flesh. Our fella is sweet and wonderfully plump and fleshy. There are some special elements about this restaurant (they run with an open kitchen, which is very rare in Sydney’s Chinese restaurant world) but the food is great without being exceptional. Hot step in and you’ll tap dance out.